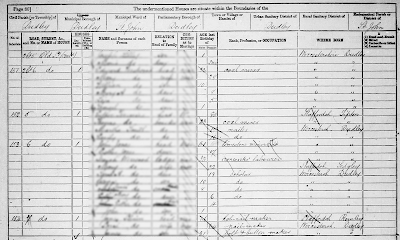 In my last blog post I mentioned searching the Find My Past 1881 census for TIMMINS in the Dudley area. Having done some further research since then I have noted that different results will be produced depending on how you complete the advanced search form. This can cause confusion if you don’t understand the terminology used by the census forms themselves, or how the people of this era defined their habitat/place of birth, etc. There are many online resources that define the terminology, however I will attempt to simplify (perhaps over simplify) how our ancestors would have understood their surroundings. Here we have the advanced search form. You immediately notice that there are numerous search fields many of which are blanked out, this is because the transcriptions were not completed for all the entries that the enumerators schedule had available. When you look at the original schedules you will understand why! The enumerators either ignored these fields or got the information wrong. 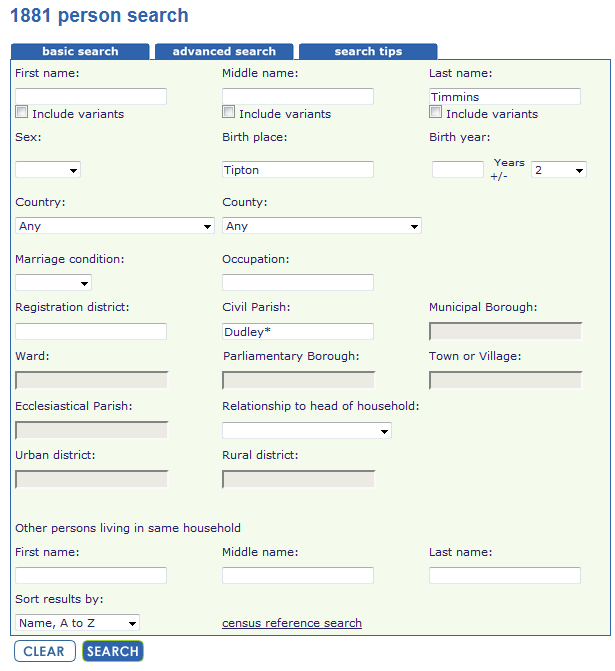 The fields to concentrate on for surname research are: Birth Place, Registration District and Civil Parish. The use of wild cards in these fields can often be very useful! Poor Law Unions – these were created by the Poor Law Act of 1834, they were responsible for providing relief to the poor in England and Wales. Unions were normally centred on a market town; their boundaries ignored historic counties and parishes. They could contain several parishes and townships. Parish – An area served by a local church; they often derived their place name from the local Manor. Manor – Its history can be traced to rural economy of the later Roman Empire. The Manor name often provided the name for the parish and covered the same area. Ecclesiastical Parish – In essence the same as a Parish. A area covered by local church or churches, it could contain a number of Civil Parishes. Civil Parish – An administrative parish; the lowest form of local government; the responsibility of the Parish Council; an area where rates could be levied. Often derives its name from the local township. Township – A sub-division of a parish; a parish would often have have several townships each with its own church. Registration Districts – In 1837 the Poor Law Unions became responsible for the registration of births, marriages and deaths. Registration Districts had the Poor Law Union boundaries. They remained in use for the census from 1851 to 1911. Counties – Civic Counties were simply the old ancient counties into which England and Wales had long been divided. Place of Birth – A township or parish is usually given as a place of birth by the respondent in the census returns. Sometimes they give the name of the parish church where they were baptised, e.g. St John. Above we have a typical enumerators return. We can compare this to the transcription below, also to information we have gleaned from the GENUKI web site. Due to the idiosyncrasies of the British system it is always wise to check on the GENUKI site before starting any searches as you may find something surprising. Take Dudley in the county of Worcestershire for instance; at the time of the 1881 census its boundaries were entirely inside Staffordshire! You will notice that using the wildcard search Dudley* in the Civil Parish field was used to provided the data that I required. 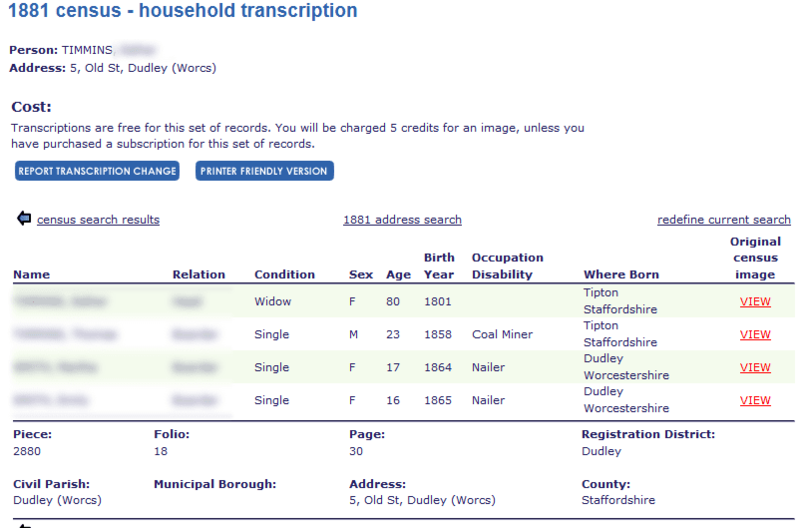 The transcription had recorded it as “Dudley (Worcs)”. 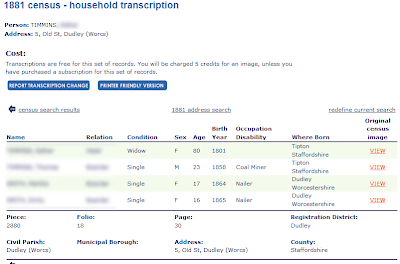 Lower down the page Rowley has been entered for place of birth, the parish is actually Rowley Regis, you will get different results if you enter either of these in the birth search field, but you will get a more accurate result entering Rowley*. The Birth Place I used in the search was Tipton, a Parish within the Dudley Poor Law Union boundaries. Tipton however is in Staffordshire! So the moral of this story is be aware of searching just on Counties or incomplete parish names, you could be missing a lot of valuable research data. 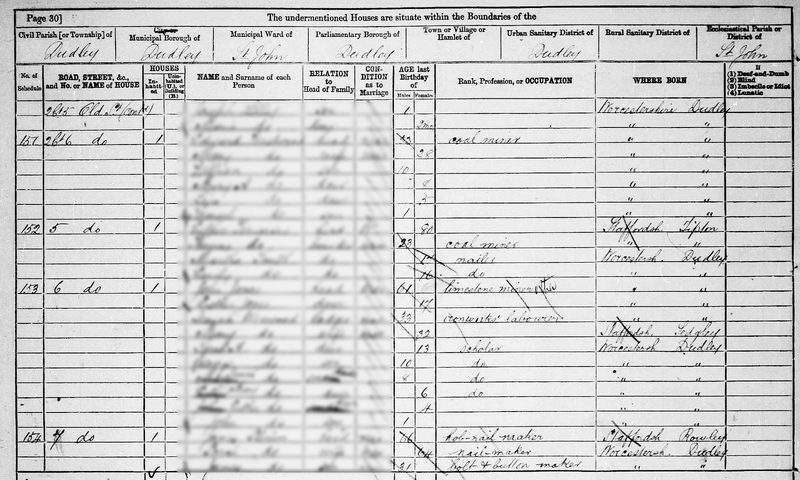 Unfortunately, not recorded or searchable is the fact that this census information was collected in the Parish of St Lukes. Hundred – At the time of the Norman Conquest Counties were already sub-divided into Hundreds for administrative purposes. Chapelry – A small church, a sub-division of a parish (often in a place of difficult access). Tything – will often be referred to in old records, they were a sub-division of an ecclesiastical parish. It was a basis for some taxation prior to the nineteenth century. Borough – have from pre-Norman times been towns and cities which have received a charter granting them certain privileges. Hamlet – Smaller than a village, usually less than 100 inhabitants. Village – Larger than a hamlet but smaller than a town, usually less than 1,500 inhabitants. Town – Larger than a village, mostly smaller than a city, usually less than 5,000 inhabitants. City – Usually larger than a town, but not always. Has a Cathedral. City status in the UK is granted by the British Monarch. Inhabitant numbers based on mid 19th century populations. “Metropolis – a large city and its suburbs consisting of multiple cities and towns. The population is usually one to three million. Village – a village generally does not have many services, possibly only a small corner shop or post office. A village has a population of 100 to 1,000. 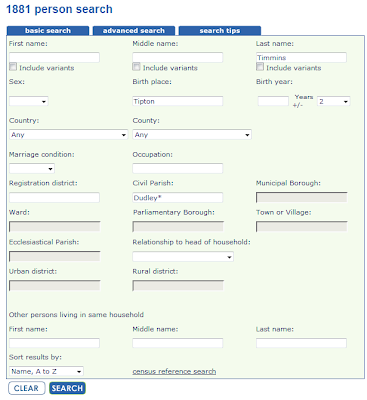 I hope the information above helps you when searching the census’. It has certainly made me think twice. I’m happy to take any comments and corrections on the article. Hopefully I have not infringed anyone’s copy-write.